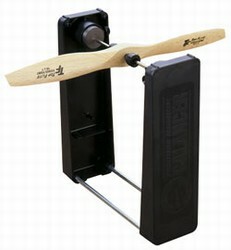 What's the Best Prop Balancer For Model Airplane Propellers? A good prop balancer is a very handy tool to have on the shelf, let me explain why. The propellers on our model planes spin pretty darn fast. Just like an out of balance tire on your car, an unbalance prop can produce some violent forces. Spending a few bucks on a propeller balancer is one of the best investments you can make. The return on your investment is potentially huge! What's the Best Prop Balancer? Top Flight's magnetic prop balancer may be the most accurate because the magnets eliminate friction in order to balance the prop more precisely. This balancer supports the propeller in the center and it allows it to rotate naturally. If the propeller is balanced it will balance horizontally. When the propeller is not balanced the heavy side will always rotate downward. Dubro's Tru-Spin Balancer is also an excellent choice. Instead of magnets, the shaft is supported with two rotating aluminum disks on each side. It's a bit more compact than the Top Flite's balancer and it gets the job done nicely. Check out the video to the right to see how it works. 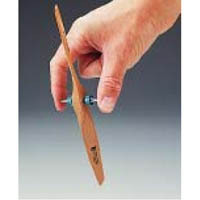 Great Planes Finger Tip Balancer is an option if you're strapped for cash. It's basically just the shaft and centering cones used in the above two machine. I've never owned one of these, but I have some serious doubts as to how accurate it could be. If you get creative and determine a way to more accurately support the ends of the shaft, you can probably make due with it. It's smart to balance all of your spare props before heading to the flying field. That makes for less equipment to bring along. And really... who wants to spend time with the o'le balancer when you could be flying or relaxing watching your buddies fly? The standard way to balance the propeller is to lightly sand the heavy side. It's not really important whether you sand the front or the back. But do not remove or sand the tip of the propeller because this will cause the propeller to be dynamically unbalanced even though it may be statically balanced. After sanding lightly check the balance again. If one side is still heavy you will need to remove a bit more material from the heavy side. Don't remove very much material at a time because you will end up chasing your tail! Repeat the process until the propeller balances horizontally. Make sure to remove sharp edges from the propeller before attempting to balancing it.